In the project SEA-SEIS (Structure, Evolution And Seismicity of the Irish offshore), scientists from the Dublin Institute for Advanced Studies (DIAS) have deployed 18 seismometers at the bottom of the North Atlantic Ocean. The network covers the entire Irish offshore, with a few sensors also in the UK and Iceland’s waters. The SEA-SEIS seismic stations, named by students from schools across Ireland. 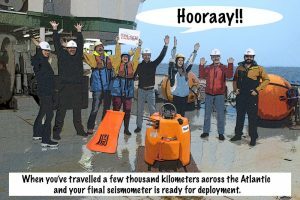 The ocean-bottom seismometers have been deployed from the RV Celtic Explorer between 17 September and 5 October, 2018, to be retrieved 18 months later. For an inspired, day-by-day account of the deployment survey, see the Liveblog by Daniel Farrell. 90% of the Irish territory is offshore, most of it to the west of Ireland. Hidden beneath the waves, there are spectacular mountains and deep valleys, with steep slopes and elevation drops of 3-4 km. There are many extinct volcanoes, similar to those that formed the Giant’s Causeway in Co Antrim, Northern Ireland. 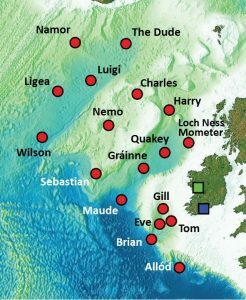 The geological evolution of the Irish offshore is fascinating, and much about it is still to be discovered. The tectonic plate that Ireland sits on was deformed and stretched to form the deep basins offshore. The plate then broke, and its parts drifted away from each other, as the northern Atlantic Ocean opened. Hot currents in the convecting mantle of the Earth caused melting of the rocks at 50-100 km depths and volcanic eruptions. These hot currents may have come from a spectacular hot plume rising all the way from the Earth’s core-mantle boundary (at 2891 km depth) to just beneath Iceland. The ocean-bottom sensors record the tiny vibrations of the Earth caused by seismic waves, generated by earthquakes and by the ocean waves. As the waves propagate through the Earth’s interior on their way to the seismic stations, they accumulate information on the structure of the Earth that they encounter. Seismologists know how to decode the wiggles on the seismograms to obtain this information. With it, they can do a 3D scan (tomography) of what’s inside the Earth. In this project, they will find out how the structure of the tectonic plate varies from across the North Atlantic and what happens beneath the plates. And is there an enormous hot plume beneath Iceland, responsible for the volcanoes in Iceland today and in the Giant’s Causeway in the past? We hope we’ll find out. The ocean-bottom seismometers are sophisticated devices able to operate at huge pressures at the bottom of the ocean (SEA-SEIS has deployed them at depths from 1 to 4 km). When released from the ship, they sink and install themselves on the seafloor. When the deployment is finished, the ship comes back and sends an acoustic signal to the seismometers. Having received it, they detach from their anchor and ascend slowly to the surface of the sea. The seismometer, data logger and the battery are all within a titanium pressure tube, protecting them from the pressure. The tube is fixed within the shock resistant foam shell (orange) that makes the instrument buoyant once the anchor is detached. The ocean-bottom seismometers are provided by iMARL, the “Insitu Marine Laboratory for Geosystems Research” hosted by DIAS. The RV Celtic Explorer is run by the Marine Institute. The SEA-SEIS project is co-funded by the Science Foundation Ireland, the Geological Survey of Ireland, and the Marine Institute.